It’s no secret charter captains have had to work extra hard to catch salmon on Lake Ontario this summer. It’s been a frustrating year for even the more experienced trollers. Abnormal weather conditions take credit for much of the melee. It seems, most likely, much colder than normal lake temperatures, a slow developing summer, late ice out and other factors could possibly have the salmon confused or even a few weeks behind schedule. Regardless, patterns haven’t been normal. And, fish counts are down on the eastern edge of Lake Ontario. Anglers are poised to swarm the famed Salmon River, the Great Lakes most popular river fishery, and might find fewer than normal fish. It’s too early to know, for sure. Maybe all the fish are going to arrive at once, which is a possibility or a large portion of the kings could stay in the lake one more year and return as goliaths next summer. We’ll find out shortly. Meanwhile, while many guides softly spoke of what could be a terrible return in September, hope has been restored on the big lake. Following months of scattered success, signs of larger schools of salmon are showing off Oswego this week. Many guides scored limits (that’s three salmon, per angler here) and noticed a fresh pod of salmon move into the area. Strikes came more frequent than they had the previous four months. 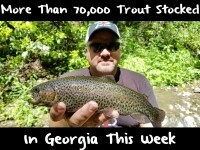 Fortunately, Team Pautzke was in town to film Pautzke Outdoors Tuesday and Wednesday with pro staffer Troy Creasy of High Adventure Sportfishing. Creasy has been realistic for a few months now, believing the run was way down, yet remaining cautiously optimistic. It caught me by surprise when his tone rose back into positive territory so suddenly. “Can you get here now?” he said to me at 9 a.m. on Tuesday. When we planned this a few months prior, Creasy told me not to show up at the dock prior to 3pm for our evening scouting trip to try and catch a few fish in attempt to take pressure off Wednesday’s full day filming session. I hadn’t heard Creasy this excited since last year, perhaps two years ago when limits came daily, and quickly. He had a step back in his voice. Unfortunately, when traveling from out of town, we couldn’t get there earlier. However, I wasn’t worried. Those fish weren’t going to migrate away before we headed out for the evening bite. What surprised me most was the number of charter boats tied to slips. This is prime time. Normally, most of them are running two trips a day. Consequently, business is down partially due to media reports of poor fishing, which might have been the case a week ago, but isn’t now. There’s salmon, and lots of them, within a mile of the dock. And, these fish are big. In fact, the next morning Pautzke pro Andy Bliss caught a 30-pound king (verified by NY Department of Environmental Conservation) on Creasy’s boat with us. 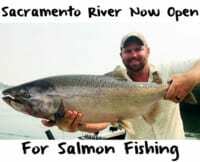 Salmon have moved in closer to shore for several reasons, the most important being it’s about time to spawn in the Salmon, Oswego, Little Salmon River, etc. They are beefing up on alewives before their journey upriver. Everyone is using three methods to catch them, as they normal do: spoons, trolling flies and brined bait. In fact, most guys run them together. While on Creasy’s boat we didn’t run any of the Michigan Stinger or Dreamweaver spoons, but did mix it up with plenty of Atomic trolling flies alongside filleted herring, placed in a Rhys Davis Cut Bait Head and dragged with Pro Troll E-Chip flashers, the eight and 11 inch models. Many boats are running blue and purple brine, but Creasy is big into Natural Fire Brine this summer. Early and late we used natural before switching to Chartreuse Fire Brine baits when the sun came out. The bites came more often than I expected. We caught a dozen salmon on brined bait and trolling flies between Tuesday evenings’s two-hour troll (we were blown off by a storm) and Wednesday mornings soupy troll. Most ran 22-27 pounds, with none smaller than 20. Creasy has picked up a few coho lately, but we didn’t see any. What’s to come is anyone’s guess. The fleet out of Oswego is in good spirits after the past few days, however. And, many are positive on what September is going to bring. While much of the pressure will shift to the Salmon River, opportunity remains on the eastern shore of Ontario, where salmon might be coming late to the party. Editor’s Note: All fish pictured here were caught filming Pautzke Outdoors Tuesday evening and Wednesday morning. 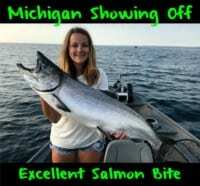 For more info on Creasy’s Lake Ontario summer Chinook salmon trips please visit http://www.highadventurefishing.com/.